New to Southport Corporation in 1965, with fleet number 54. She is a Leyland Titan PD2/40 with Weymann O64F body, converted from H64F. When Southport was absorbed into Merseyside, there was uproar among the natives, who wanted to remain in Lancashire. The place does, after all, have a Preston postcode rather than a Liverpool one! Do the residents still hold – as many in Bournemouth and Christchurch do in respect of Hampshire and Dorset – that they live in Lancashire, but Merseyside is allowed to look after certain aspects of life? We see her on Southampton’s Itchen Bridge on 6 May 1979, while taking part in the local operator’s Centenary celebrations. Regarding the open top Leyland currently on site, please find attached a photograph of the bus? OR an identical one. It is seen on Trans Pennine 2015 and is in the William Hunter collection. Tracked your picture down to 154 reg, my picture is of 151 ! Hello, Roy! Thank you for your thoughts. I’m afraid I can’t help you, as the BBF ‘Lancashire Municipal’ book I found a few years ago doesn’t include this batch. I am, however, very confident that at least one of the other readers will be able to advise us both! There’s almost a Beverly Bar tumble-home to CMW 151C’s upper deck glazing, distinctive I suppose. Yes, Stephen, there is. I hadn’t noticed on the view of 154. Can anyone tell us if they were converted at the same time? The fleet list noted above suggests they were still H rather than O at the time of transfer to Merseyside. Oh, Southport’s resistance to Merseyside has taken many forms over the years. In bus terms red wheels were one of the first signs, then the use of municipal livery on open toppers and more recently on park and ride buses. As for the town itself since the abolition of the county council I suspect it’s less of a problem although sharing Sefton Borough with parts rather close to Liverpool has been a problem. I believe they managed to get Merseyside off the postal address a while back but in these days of ceremonial and postal counties and fragmented political counties it’s all a mess. I prefer to go with geographic counties which spares poor old Middlesex and puts my old home town of Widnes firmly back in Lancashire. On the Wirral they managed to get their postcodes changed from L to CH with a positive effect on insurance premiums…. Prior to 1974 Southport was a County Borough: County Boroughs were created in 1889, when administrative County Councils were established, for larger towns/cities for which it was felt that administrative control by the County would be inappropriate/impractical – they were abolished by Peter Walker’s Local Government Act (1972). It’s my understanding that Southport was offered the option of incorporation as a Borough within either Lancashire or the Metropolitan County of Merseyside: the former would have allowed it to retain it’s transport undertaking but would have meant responsibility for education passed to Lancashire County Council, whereas Metropolitan Boroughs retained control of education (but lost control of transport to the PTE) – clearly the Aldermen and Councillors of the County Borough of Southport knew where their priorities lay. Initially it was proposed that the 1974 County boundaries would apply solely for administrative purposes and that existing County boundaries would be retained for postal and ceremonial purposes, but . . . I know exactly what Philip R means! In Southampton, there were moves to have the whole of Southern Hampshire – including Portsmouth – declared a Metropolitan County, so the local districts could maintain control of Education which, otherwise, would go to ‘those idiots at the County Council’. Gosport was what was called an "Excepted District" for Education, and Fareham was only an Urban District. It was, however, pointed out that a Metropolitan County would control the buses through a PTE, so the idea was dropped in favour of keeping the buses under local control and losing the Education. Along with at least two dozen fellow enthusiasts, I spent the best part of a week in the Spring of 1988 on holiday with 0651 as our principal mode of travel, the group having hired it, with several holding PSV licenses so that we could drive it ourselves. It was a fine week, with plenty of time spent on the upper deck in the sunshine, and I shan’t ever forget the crackling roar the old PD2 made as it pounded surefootedly up the steep Matlock Bank on the way to Chesterfield and Sheffield on the last night of the holiday. What a fine tribute that superb machine is to the designers and workers who spent their careers at the Leyland factory. Dave C, I think someone had clearly attended to the governor on your vehicle. I remember joining a tour of West Yorkshire in 1977 which used similar but earlier PD2/44 and thinking that it couldn’t pull the skin off a rice pudding! I was used to the performance of Halifax’s almost-identical vehicles and the comparison was stark. I always assumed that Southport’s were governed down severely as they only ran on very flat routes. I was an apprentice fitter at Southport Corporation, Canning rd. Depot in the late 60’s. The batch of buses you were asking about were numbered from 43 – 57 and they all had vacuum brakes as opposed to air brakes and manual gearboxes not semi automatics and the 01 prefix numbers were only applied after the MPTE takeover. The later batch nos. were converted to OMO operation by moving the drivers N/S cab window outwards over the bonnet and the driver had to literally turn round to the left and face backwards to collect the fares, something of a feat even in those days! The Drivers who opted to become OMO drivers were paid the princely sum of 3d an hour more (note not decimal pence btw) to become OMO drivers! Mr Alan Westwell (now Dr. Alan Westwell) designed the cab window arrangement conversion when he was ‘The Rolling Stock Engineer’ at Canning Rd., note the title of RSE as opposed to Chief Engineer, as the title was from the old tramway days of long ago! When London Country came into being in 1970, it, too, set up the post of RSE (Rolling Stock Engineer). He was then supplied with an Assistant, so entitled, until the unfortunate acronym thus created subsequently led to the renaming of the post as ‘Deputy’. At Derby Borough/City Transport we had a Chief Engineer (the late Gerald Truran), and, a Rolling Stock Superintendent, and an Assistant Rolling Stock Superintendent. The latter two posts being a throw back to Trolleybus days. I can assure you that the title of Rolling Stock Engineer is still alive and well in the tramway field. I am one! I am a volunteer at The North West Museum of Transport in St. Helens. We are at present in the process of restoring Southport Corporation 62 a 1946 Daimler Utility CWA6 which apparently is one of only a few surviving CWA6’s with genuine wartime utility bodies by Duple. We have just fitted a replacement AEC 7.7 engine which by all accounts are as scare to say the least. This particular vehicle finished it’s life at Aintree Racecourse as a Stewards Bus on the racecourse when the museum acquired it many years ago. 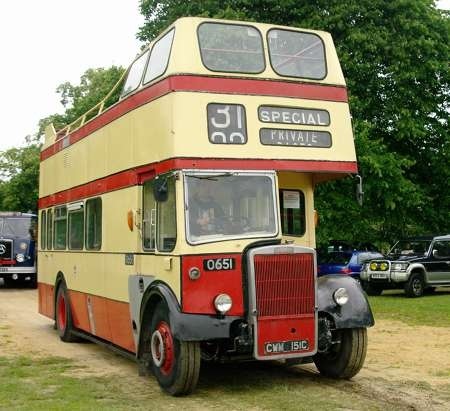 If anyone has any more information regarding this bus please can they get in touch as we do have some very limited information on it as it is a genuine wartime utility bus bodied by Duple. 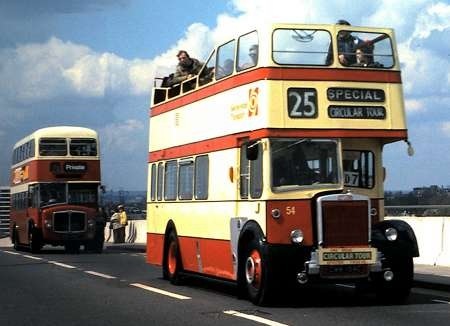 I am glad Ronnie Cox didn’t let him convert Glasgow’s 229 forward entrance Double decks for OMO and I am sure the surviving drivers from early GG PTE days are too! In the foregoing comments there is a reference to a PD2/44. I am not acquainted with such, thinking that PD2 variants ceased at No 41. Was 44 a special to Southport? I was wondering who would claim it was a PD2/44 then realised who wrote the post…. Re. Southport 62, the Utility Daimler. I was a volunteer at Steamport in Southport when 62 arrived. It was exchanged for Birkenhead 15, a PD2. It had been used as a sort of grandstand for the motor racing circuit at Aintree and was possibly a commentary position though I can’t be certain of that. When there was a clear out of some vehicles at Steamport there was a danger that it would be scrapped. Fortunately, I was able to arrange for it to be towed to the former Large Objects Store in Liverpool where it remained for some years. Upon the closure of those premises I assisted in removing the bus to a position outside the building to await removal to St Helens. During this operation 3 out of the 4 of us who were involved were attacked by cat fleas, presumably rather upset that the wild cats that had been living on the bus had fled the scene! Good luck with the work on 62. I was impressed all those years ago that the bodywork was so solid despite it being a Utility. If it still has a lot of blue seat frames stored upstairs, they are from Birkenhead 15, not being required for its role taking over from 62. Typo notwithstanding, it isn’t true that PD2 variants ceased at 41. In the final "rationalised" range, the former PD2A/24, PD2A/27, PD2A/30, PD2/34, PD2/37 and PD2/40 were replaced respectively by PD2A/44, PD2/47, PD2/50, PD2A/54, PD2/57 and PD2/60. However, only the PD2/47 was actually built, for St Helens, Lowestoft and Darwen. Thanks for that. I had a nagging feeling that I’d read about the PD2/47 somewhere. Just an update on the Southport Daimler 62. The replacement engine has now been fitted and runs extremely well and lo & behold only a couple of months ago we actually moved 62 in the museum to another space next to where it was parked, albeit basically10ft the the right in the shunt, but it actually was ‘driven’ to the next space after well over 28 years of having no engine in it and although the brakes were shall we say not exactly functional the handbrake worked perfectly (except for the ratchet which was sticking) and so did all the pre-select gears including reverse!